Winter Cheer is a holiday style with a lot of class. In chic color combinations and strewn with merry little snowflakes all over, each one different, and funny little dots here and there, it adds charm and fun to your holiday. The main letter style is a condensed, plain sans serif so your message can be simple, short and bold. The supporting text is a bold script font for added fun. All the colors mix well with each other so you can get a variety of colors for your many needs. 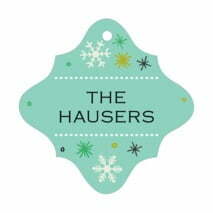 Customize your Winter Cheer hanukkah tags today! Winter Cheer Hanukkah tags are printed on extra-thick cover weight white paper and come in a variety of shapes and sizes (including square, circle, a scallop-edged circle, ovals, plus other more intricate shapes). They are printed on one side and are blank white on the back. You have the option to add text on the back for a small fee—just ask! Hanukkah tags come pre-punched with a small round hole to thread your choice of tying material. They are punched out individually and packaged as a set in small bags. Select a Winter Cheer Hanukkah tags shape and color above to get started!